Packing for a trip is all about getting organized and having a good process to follow. Although it still takes a little trial and error, the amount of time it takes for me to pack now versus a few years ago is astronomical. I travel 1-2 weekends a month for both business and leisure. When you are on the go this often, it's important to have a good system to ensure you don't forget anything or end up with too much luggage. Let's discuss a few ways to make life easy when packing. You can also sign up to receive packing checklists, more tips and the information listed on this page. Sign Up here for More Packing Tips Straight to Your Inbox! Traveling is my number one hobby. I love to see new places and have new experiences. It started as a child. Growing up, my parents took me all over the world as we moved from city to city in the military. I am so thankful for those experiences because they truly shaped who I am now. There were many things I learned about traveling, but two things really resonated over the years – travel light and comfortably. Packing in style helps you feel put together and confident. I decided to put together a list of a few ways I’ve found to make life easier when you travel. The first is to pack light. This means if I am going for less than a week, I only take a carry-on bag for warmer months. Cold weather sometimes requires a little more luggage due to bulky items. But Spring-Fall I stick to a single bag. I picked this bag up because it’s dark colored which hides scrapes and scratches, but has simple trim to easily spot it coming down the conveyor belt. The second thing is dress comfortably. I like to wear jeans or leggings (not shorts… they ride up and can get uncomfortable after sitting for a few hours), a lightweight top in case the plane is hot, a sweater in case I get cold, and easy to remove shoes. I usually take a tote to keep my notepad, tablet, and toiletries handy and it doubles as a beach bag or pool bag. If I am taking a hat, I usually put it on as well so it doesn’t get crushed in my bag. Finally, when packing, picking a color palette allows me to coordinate everything. An upcoming trip that I have includes a palette of blush, tan, cream and black. That way, I only have to bring a purse or two and a few pairs of shoes. Also, I always have comfy flats to walk around in and at least one pair of heels. Shoes seem to take up the most space, so I am always careful about the selection. And always, always, always pack a swimsuit – even if you go somewhere with snow. It pays dividends and you never know if you will have an indoor pool or hot tub. I cannot tell you how frustrating it was for me prior to learning how to pack in a carry-on. I mean FRUSTRATING. From carrying heavy bags to losing luggage at the airline, it became too much. I decided after my bags were delayed 24 hours in San Francisco on NYE… it was time – time to simplify. So, I started with Pinterest and scoured boards to find better methods. I spent hours on Google looking up ways to pack lighter. Fast forward years later, and I have it down to a science. Here are few ways to make your life easier and carry less! Dresses and Rompers – They take up less space. I carry 3-4 from dressy to casual. You can throw a cardigan, blazer or sweater over and give it a second look. Limit Toiletries – I pack only the necessities. I also limit how much makeup I bring. Put them into smaller containers and everything goes in a TSA approved clear pouch. Packing in a Color Scheme – Depending on the length of travel, I usually will pack in 1-2 color schemes. I wrote another post all about picking a color scheme, but it makes a difference in how many bags/shoes/accessories end up getting tacked on. Wear Bulky Items – Jeans, tennis shoes, coats or boots should be worn on the plane to reserve more room in your bag. See this post for more tips! Plan Your Outfits – I lay everything out on my bed or floor in outfits to make sure I’m not missing anything. It makes a difference when I arrive because I spend little time thinking about what I am going to wear and more time doing things I’m interested in. 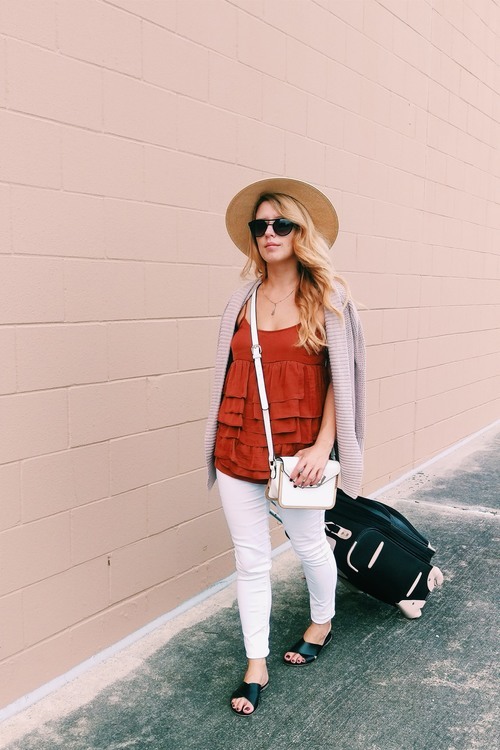 Double Use Bags – I use my tote for the beach, shopping and double as a personal item on the plane. I also will pack a clutch inside of a cross body. That gives me 3 bags as options and takes up little space. A lot of people will tell you to limit your shoes, but here is where I disagree. I usually pack smaller and less bulky shoes like ballet flats, simple leather slides and maybe a pair of heels. I find that as much as I love wearing heels, I don’t usually want to put them on if I’m doing a lot of walking when I travel. Hope these tips help! If you have more questions, feel free to reach out via email or leave a comment! I’d also love to hear your tips or tricks! I mentioned in my previous post here all about how to pack and dress comfortably. I thought it would be good to expand today. I took a trip earlier this month to Birmingham, Alabama where my grandparents reside. We were only there for a few days and decided to drive from Texas to Alabama which is a 10-12 hour drive. Knowing that the attire was really casual, I pack in a very simple colors scheme – navy, red, white and denim. Picking a color palette allows for you simplify your pack and get more outfits out of what you bring along. On this particular trip, I also brought a black dress and leopard flats and then a striped sundress that I wore with leather flats. I added the pink cross body for both outfits. It was casual, comfy and put together. In picking a color palette you can travel lighter and are more organized. No longer will you end up with tons of items you won't wear or too much luggage. The key is to lay your outfits out before and have things that will mix and match. A key factor in simplifying your pack and packing in style is also to pack for the right season. If I'm headed somewhere cold I'll always throw in something lighter weight and a swimsuit, but that's it. The rest of my suitcase is filled with cozy clothes and water resistant boots. You can pack so much with a limited amount of items if you are strategic. Part of that strategy is looking at the weather conditions and planning a week or two ahead. In all honesty, I never wait to the last minute to pack (outside of my toiletries). It just leaves too much room for error. I have lists going weeks in advance and then put everything in my suitcases a few days ahead. That way I'm not wearing something I'll use on the trip the day before and then get stuck doing laundry at the last minute. I reference the Accuweather app two weeks ahead of my trips. It allows enough time to brainstorm or order anything you need from Amazon Prime (my go to for anything last minute). Then, I start making lists or pinning ideas on hidden Pinterest boards of ideas of looks I may want to draw inspiration from. About 7-10 days before a trip I lay out all of my outfits and decide if I need to purchase something to add to the things I already own. About 3-5 days before I start loading up my suitcase. Finally 1-2 before I leave (usually early morning flights or late evening after work) I pack my carry-on and purse for the trip. This timeline has proved to be really helpful over the past three years. Summer: Think sundresses, rompers and swimwear. Don't forget to add sunglasses, a straw tote, statement earrings and sandals. Bring at least one pair of heel, but usually you are spending time by the water so one is plenty. Espadrilles are a perfect summer shoe. The best part about Summer packing is that you can pack more in your suitcase since items are smaller and lighter weight. Take advantage and bring lots of sundresses. I usually bring two outfits per day for Summer trips. If you are looking for swimsuits check out how to find your swim style. Spring: The climate in most places ranges from warm to cool depending on how far north you go. If you are heading to a colder climate like Colorado or the North East Coast you may want to refer to packing closer to Winter. If you are anywhere along the Southern part of the United States think about lightweight jackets and cardigans layered over dresses and jeans. Loafers and ballet flats are a good choice this time of year and if you are looking for accessories you can sport structured pastel leather purses. Boater hats are darling this time of year and don't forget a tote for market shopping or visiting farms. Fall: For this season you'll also want to look at layering but instead of Spring's choices go for pants with tall riding boots (here are two ways to wear riding boots for the Fall) and sweaters. Layer your sweater over a button up or long sleeved shirt in case you get warm. Pea coats are also a good choice during this time of year. For evenings sport a pair of tall suede over the knee boots with a tweed mini skirt or midi dress. Cognac, burgundy, hunter green and navy are perfect for the Fall season. Since so many people love to go camping this time of year you can check out Let's Go Camping which includes all about how to pack for a night outdoors or check out Outdoor style for additional inspiration and tips. Winter: If you are heading South you may want to reference Spring and Summer styles, but if you are on your way up North think about being warm and dry. Snow is beautiful unless you are inappropriately dressed and then it's just miserable. Down jackets, leggings, overalls, skinny jeans, puffy vests, sweaters an thermal shirts are great for layering during cold and snowy days. Don't forget to add beanies or berets, gloves and of Winter boots. Finally, if you are venturing out for a dressy look think about faux fur stoles, cream colored wool coats that hit at the calf, tall boots or tights and heels. Want more seasonal inspiration, tips and tricks? Head over to the seasonal style page for additional looks and travels.